Nearly every day in my practice someone asks me what impact a bankruptcy will have on a spouse, or whether both spouses are required to file when one does. There seem to be a great number of people in Central Massachusetts that want to file a bankruptcy, but leave their wife (or husband) out of it. Sometimes, they prefer to keep the matter a complete secret from their spouse. Sometimes they are only concerned with preserving one spouse’s credit worthiness, when the other spouse files. The bottom line is there is no law that requires that a married person file with his or her spouse. There isn’t really even a specific provision that requires that a non-filing spouse be given notice of the bankruptcy (unless there are joint debts). However, it is certainly easier if there is at least cooperation between spouses in putting together the documents necessary for a complete filing. In every consumer bankruptcy case there is a requirement of complete disclosure of all family income for, at a minimum, the previous six months as part of the means test. That means that your attorney must review and disclose the information from each and every pay stub for both the debtor and the non-filing spouse. More importantly, the Trustee has the right to review pay advice, tax returns and even bank statements (among other things) for both a debtor and his non-filing spouse. Another important thing to consider is how jointly held assets will be impacted. A married couple filing jointly will have, in most cases, double the exemptions available to marital assets. In instances where both a husband and wife jointly own two cars, for example, were only one spouse to file for bankruptcy protection, it is possible that a one-half interest in one of the two cars might be available for sale by a Chapter 7 Trustee, or might have to be considered in a liquidation analysis as part of Chapter 13 plan, which could mean a higher monthly plan payment. These issues aside, I typically recommend at least considering filing a joint bankruptcy case with your spouse for two very simple reasons: the discharge and the cost. 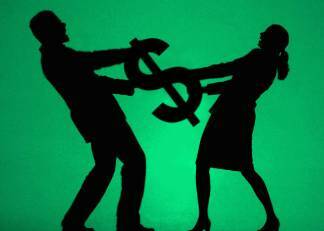 Most couples have at least some joint debt. Whether it be a credit card, a car loan, a mortgage loan, or a guaranty of a business loan, there is typically at least something for which both spouses are liable. At the end of the bankruptcy case, when a discharge is issued, a non-filing spouse, who is co-obligated on debts may be the only source of recovery for the creditor. If the goal is to get a fresh financial start, shifting the problem of collection from you to your wife, may not be the solution. Those trying to keep a secret from their spouse should know that the law requires notice of a bankruptcy to others obligated on your debt – so if your wife is jointly responsible for the mortgage, or your husband guaranteed that small business loan, your are legally required to give them notice of the bankruptcy. Perhaps more important for some is the cost. The filing fee paid to the Bankruptcy Court is identical for an individual case or for a joint case with your spouse. Just on that point you will have saved yourself $335.00 by filing a Chapter 7 case together, rather than filing two separate cases. Also, the fees paid to your lawyer (at least in my firm) are the same whether you file individually or a joint case with your spouse. Despite these benefits, there may be times when it makes strategic sense to file separately from your spouse. No two situations are the same, and bankruptcy advice is most assuredly not one size fits all. If you are married and struggling with debt, it is imperative that you discuss all these issues (and more) with an experienced bankruptcy lawyer today. Call the Law Offices of James Wingfield at 508-797-0200, visit the contact page on our website or fill out the form below to schedule a consultation today.